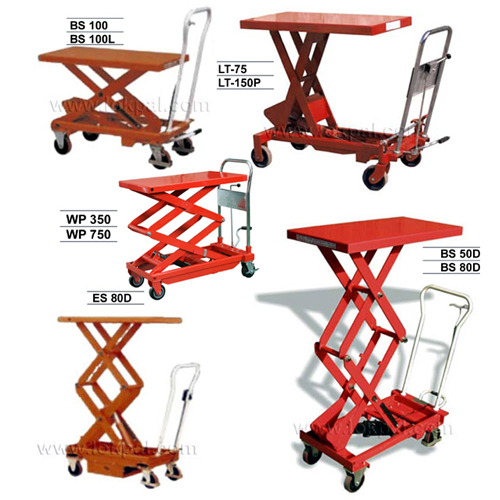 Hydraulic Liftable loading dies in machines racks for different jobs works at different heights with different loading capacities, different platform sizes. Can go through narrow asiles powdered coated. Lifting platform that allow materials to be raised and/or lowered to various, ergonomically optimum heights for specific application or process. 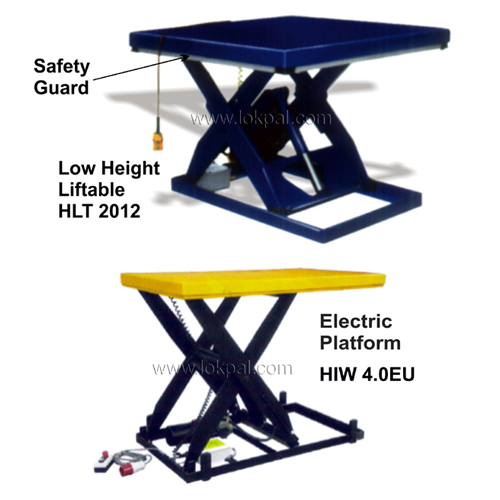 Economical versatile lift table with 1500kg to 3000kg capacity and maximum raised height of 1450mm. 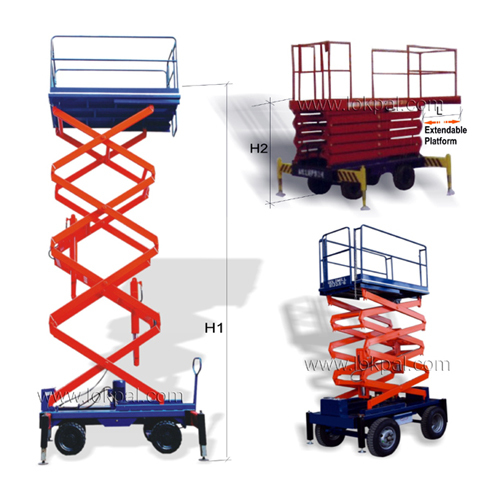 Multi Scissor Lift Table is very useful equipment for doing indoor and outdoor work at different heights. Solid Scissors, Hard Crome Plated Pistons. Fitted with large pneumatic wheels. Used in Industries, Malls, Metros, Warehouses etc. 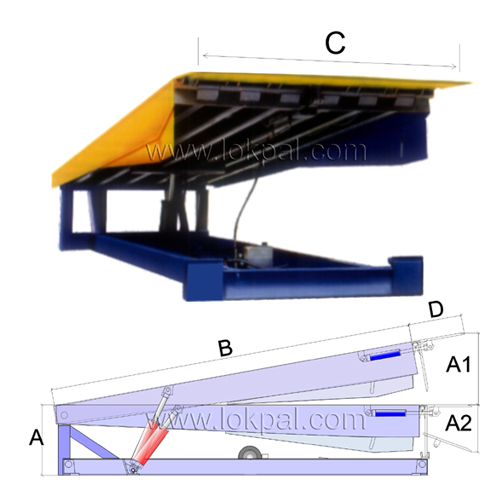 Dock Leveler are also known as dock boards or dock plates. Dock levelers can enhance safety and productivity on the dock through a variety of design features. Different types of levelers are appropriate for different industries and/or different operations. Dock Levelers are devices used to bridge the gap between the loading dock and the truck, during loading/unloading. Most Truck trailers come with bed heights either above or below the dock. The Dock Leveler moves up and down to meet the truck bed height so that forklifts and other work trucks can move smoothly in and out of the truck. 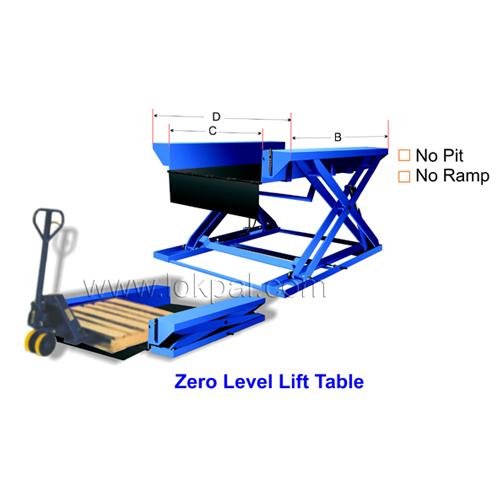 Zero Level Lift Table just with one touch, you can load/unload material from trucks, containers, etc. NO RAMP OR PIT REQUIRED Floor - Level Platform lowers to the ground to allow safe loading of standard size Pallets with a pallet truck. Can Load/Unload, Boxes, Trolleys, anything at ease. Easy Installation Just Bolts to floor. 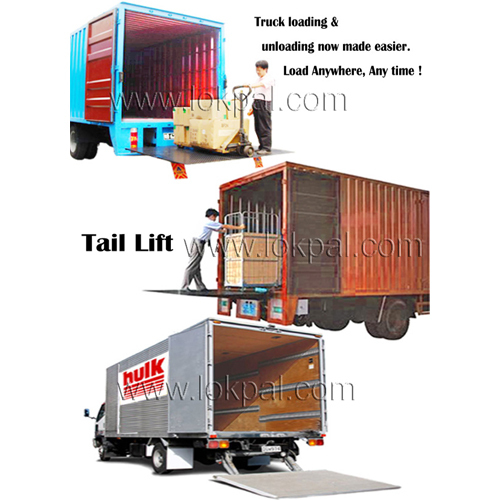 Being a mechanical device, Tail Lift gets permanently fitted to the back of a vehicle. It is ergonomically designed that facilitates the handling of goods from ground level to level of load bed. The materials used for the manufacturing device work on the principle of hydraulic and pneumatic system. This is generally required for loading of heavy items on to a vehicle and decreases the difference in height between loading materials and vehicle load bed. Steel platform or aluminum platform. 2 single acting lifting cylinders and 2 tilt cylinders with spring assisted platform opening. Automatic mechanic leveling at the ground Platform tilt adjustable at any position. Low maintenance bushes fitted to all pivot points. Mechanical chain lock to prevent the open of platform accidentally.